As in childhood most of us tend to approach games and new endeavors with “Get ready. Get set. Go!” But when it comes to writing “getting ready” and “getting set” can easily become a quagmire of avoidance that brings us to a stop. Write. 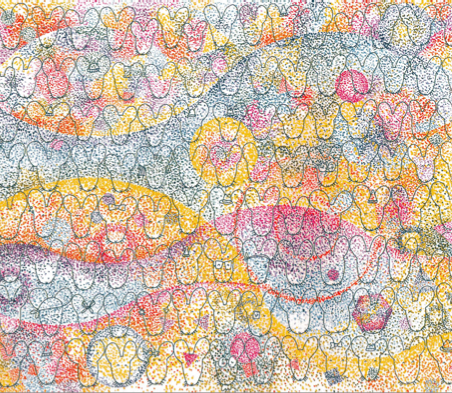 Doodle with words and ideas. Write without clinging to previous ideas. Write to discover what the writing reveals. Write without fearing a finish line. Write with the playful flow of Bidemmi in Vera Williams’ CHERRIES AND CHERRY PITS. How many stories can grow from a single cherry pit? More and more and more and more. 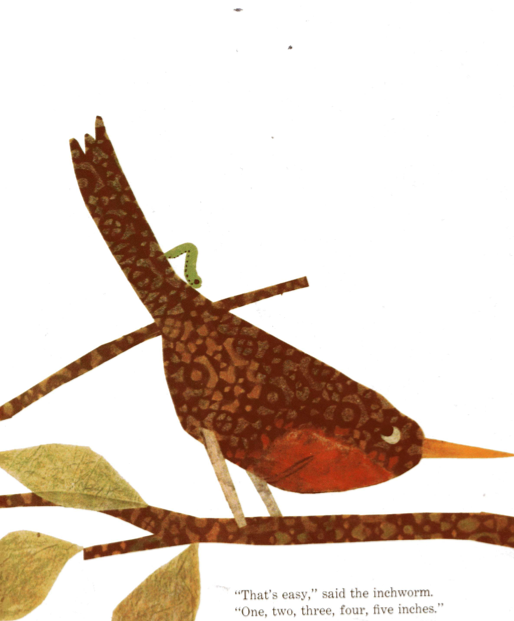 At the “Go!” stage of writing picture books there are no mistakes. Surprises and frustrations, yes. But these offer more opportunities. REGINA’S BIG MISTAKE by Marissa Moss shares this truth as a picture book. The class assignment is to draw a picture of the jungle. As she draws the sun Regina’s crayon slips. It’s ruined! Not true. Her ability to keep going, to keep imagining allows her to created something unique. Everyone else draws the jungle in daylight. 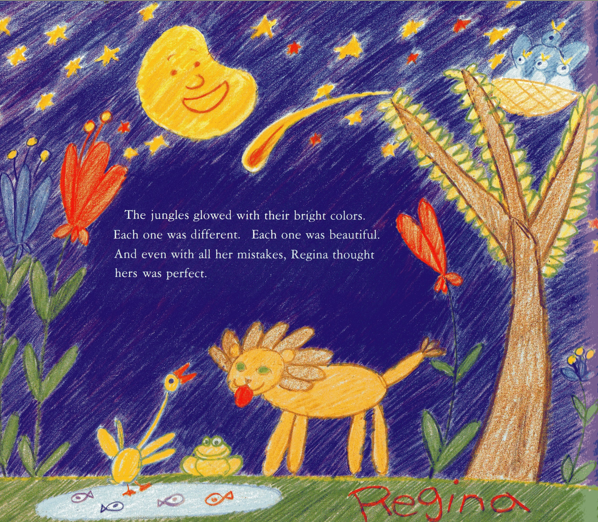 Regina’s ruined sun becomes the perfect moon for her distinctive picture of the jungle at night. 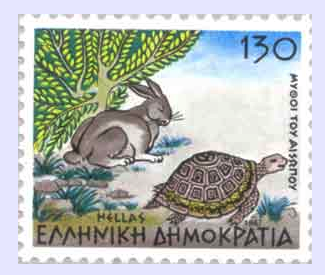 Just like Aesop’s tortoise wins the race through ongoing action, picture books are created in the “Go!” of writing. 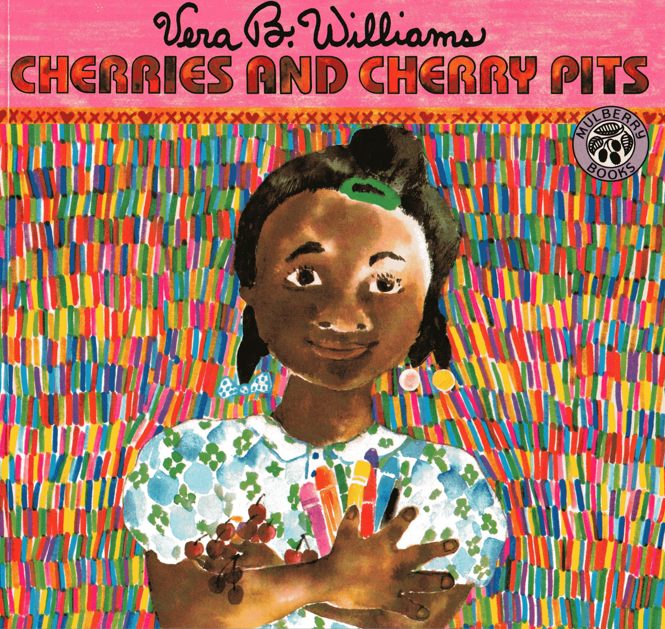 CHERRIES AND CHERRY PITS by Vera Williams. Greenwillow, 1986. REGINA’S BIG MISTAKE by Marissa Moss. Houghton, 1990. 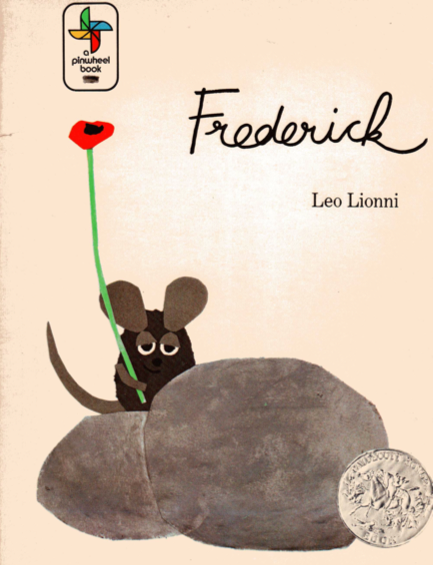 FREDERICK, Leo Lionni’s treasured twist on “The Ant and the Grasshopper” features a poetic mouse named Frederick. While the other mice gather food for winter, Frederick gathers sunrays, colors, and words. As his fellow field mice eventually discover, Frederick’s gathering colors and words is as vital as gathering corn and wheat. One pair nourishes the body. The other nourishes the spirit. This awareness celebrated in FREDERICK is significant to all writers. And especially so when the calendar and/or family life becomes very hectic. At times, there is truly be no time to write for several days or even weeks. But that does not exclude gathering colors and words. They exist no matter what the time, temperature, or schedule. And, even when there is time to write, it is important to remain awake and open to life and the arts in all their expressions. Why? First, it is a vibrant way to live. Second, it continues to nourish our life and our writing. What we truly experience becomes a part of us. It is what we gather (like Frederick’s colors and words), and lets us create and share our creations. 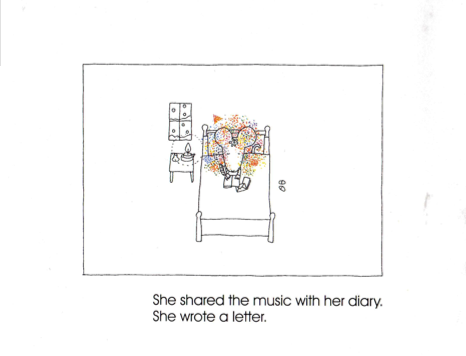 Yuko Takao’s picture book, A WINTER CONCERT, offers additional support for our role as receiver as well as creator/writer. No one creates in a vacuum. Takao’s unnamed mouse protagonist attends a concert in the dead of winter. 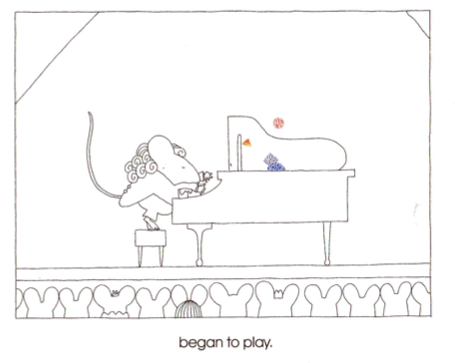 The pianist makes beautiful music that fills the concert hall and the ears and hearts of the audience. That night the music (the experience and awareness) still lingers in the mouse’s thoughts, and becomes a part of what she creates. 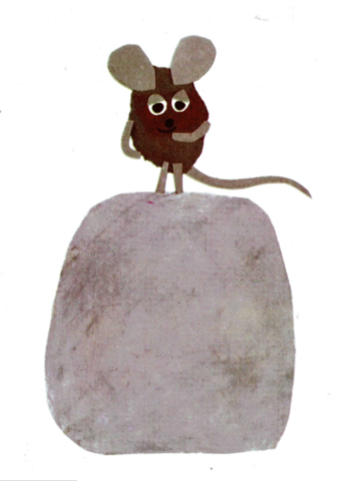 During both calm and hectic times this winter, may we be as open, aware, and self-nurturing as these two mice. When our writing time returns (and it will) we’ll have all the more to share. FREDERICK by Leo Lionni. Pantheon, 1967. 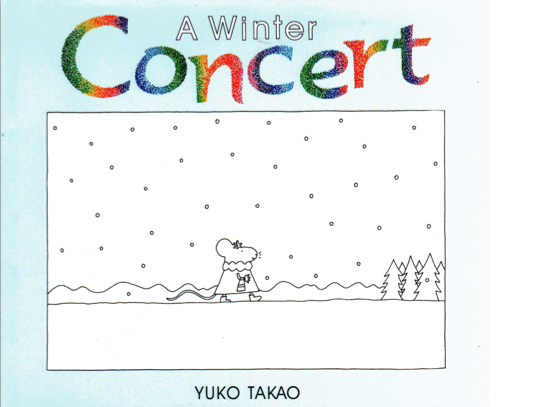 A WINTER CONCERT by Yuko Takao. 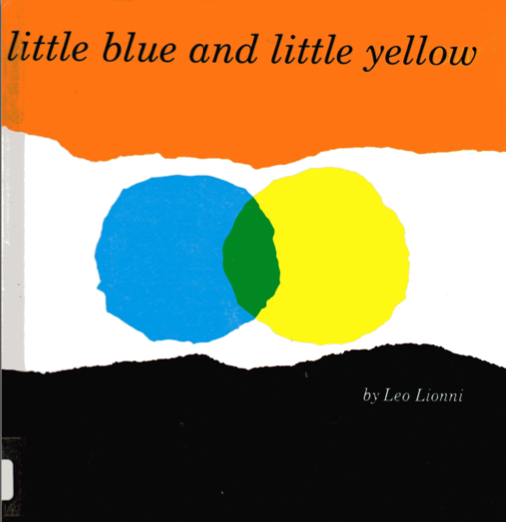 Millbrook Press, 1997 (1995). Just like the patterns of text explored in earlier posts, Writing to Be Heard, becoming more aware of the perimeters and proportions involved with a picture book story helps us hone our writing. I recently gathered a canvas bag of picture books at my library, and began to see how they compared with the triangular template. I found more small variations in total number of pages than I expected. However, the proportions or percentages of space and text within the perimeters were basically the same from book to book. Introduction of characters, setting, and conflict. Characters struggle to resolve the conflict. This is, again, the part of the story where the audience becomes fully engaged in the story as the characters take action. It is also the largest portion of most stories. After several attempts the characters finally resolve their conflict. The question stated in the beginning has now been answered. Cue the final music. A final, very brief moment of celebration and/or wink to the audience. It can be very beneficial to see how our story-in-progress fits these proportions. If our introductory/green passage takes up more pages and text that the action section of solving the conflict, we would be wise to tighten the beginning. If the action/blue passage of our story is less than 40% we know our manuscript could be improved by expanding that section. And, if the finale’/yellow section of our story involves more than 10% of our text we need to be very sure why it has to be that long. If we can’t explain why, then it’s time to try a shorter draft of that passage. The primary goals of sharing a story are to connect with the audience and keep them engaged. If we fail to do that, we lose the chance to share our theme and the events involved. 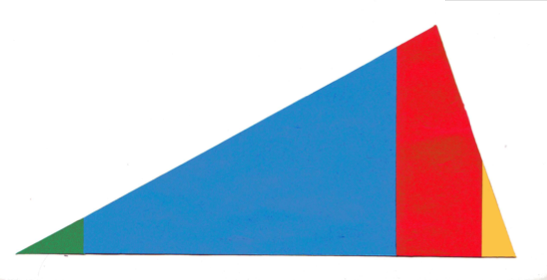 The perimeters and proportions of basic storytelling exist because they work. They are not the only game in town, but they are certainly the most established. 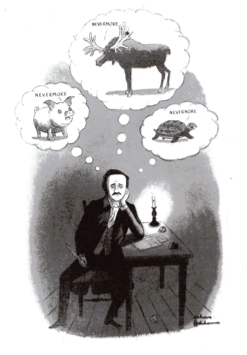 HORACE AND MORRIS BUT MOSTLY DOLORES by James Howe. Illus. by Amy Walrod. Athneum, 1999. JULIUS by Angela Johnson. Illus. by Dav Pilkey. Orchard, 1993. MIKE MULLIGAN AND HIS STEAM SHOVEL by Virginia Lee Burton. Houghton, 1939. MRS. POTTER’S PIG by Phyllis Root. Illus. by Russell Ayto. Candlewick, 1996. OFFICER BUCKLE AND GLORIA by Peggy Rathmann. Ptunam, 1995. PIGGIE PIE by Margie Palatini. Illus. by Howard Fine. Clarion, 1995. A TREEFUL OF PIGS by Arnold Lobel. Illus. by Anita Lobel. Greenwillow, 1979. A VISITOR FOR BEAR by Bonny Becker. Illus. by Kady MacDonald Denton. Candlewick, 2008. WILL I HAVE A FRIEND? by Miriam Cohen. Illus. by Lillian Hoban. Simon & Schuster, 1967.